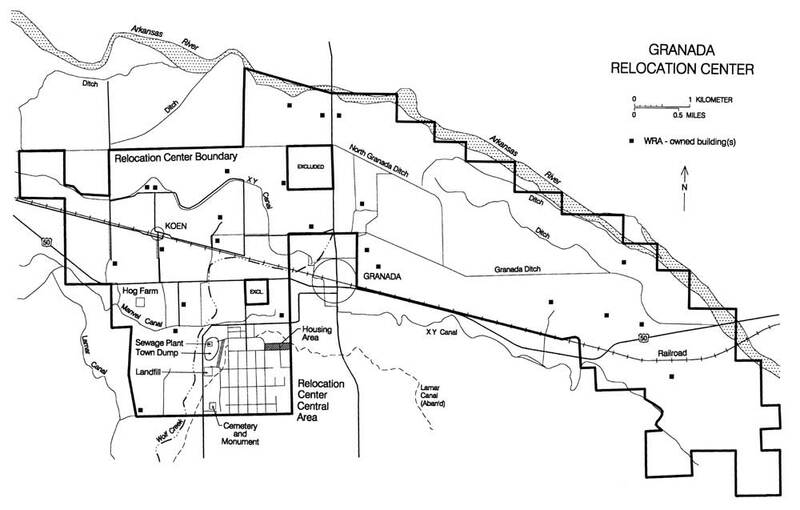 The Granada Relocation Center was located in southeastern Colorado 140 miles east of Pueblo. The relocation center site is 16 miles east of the town of Lamar and 15 miles west of the Kansas border. The relocation center's common name was derived from the small town of Granada, less than a mile away. However, the postal designation was Amache, after a Cheyenne woman who was married to John W. Prowers, a nineteenth century rancher for whom the county is named. Averaging about 3,600 feet in elevation, the relocation center is on a wind-swept prairie that slopes gently from south to north toward the Arkansas River, 2-1/2 miles north. Cottonwoods grow along the river, but without irrigation, the land is fairly arid, with wild grasses, sagebrush, and prickly pear cactus common. 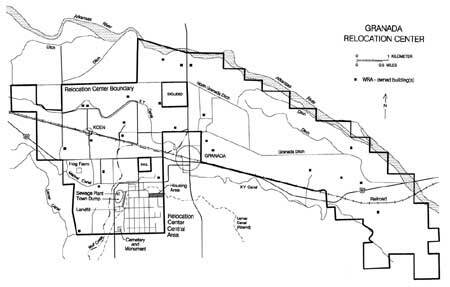 Figure 5.1 Granada Relocation Center. 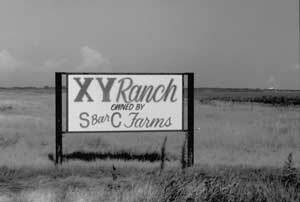 Figure 5.2 XY Ranch lands today. The 10,500 acres of the relocation center reserve had been 18 privately owned farms and ranches, acquired by the WRA through purchase or condemnation (Figure 5.1). The largest parcels included the former company town of Koen, owned by the American Crystal Sugar Company, and the XY Ranch, founded by Fred Harvey in 1889 (Figure 5.2). For the planned agricultural projects, the WRA also purchased water rights to parts of the Lamar, Manvel, and XY canals, which flowed through the reserve and fed existing irrigation ditches. The Wolf Creek drainage flows northeast to the river just west of the developed part of the relocation center, but the creek bed is currently dry most of the year. Construction of the relocation center began June 12, 1942, with a crew of up to 1,000 hired workers and 50 evacuee volunteers; the general contractor was Lambie, Moss, Little, and James of Amarillo, Texas. The center was in operation by the end of August 1942, and reached the maximum population of 7,318 by October. Although Granada had the smallest population of the ten relocation centers, it was the tenth largest city in Colorado when it was occupied. Evacuees were from the Merced and Santa Anita assembly centers. There were over 560 buildings, including a few composed of sections of former Civilian Conservation Corps buildings transported to the site (Simmons and Simmons 1993). The central or developed portion of the relocation enter was located on a low bluff overlooking the flood plain and farmlands, which extended to the north and east all the way to the Arkansas River. 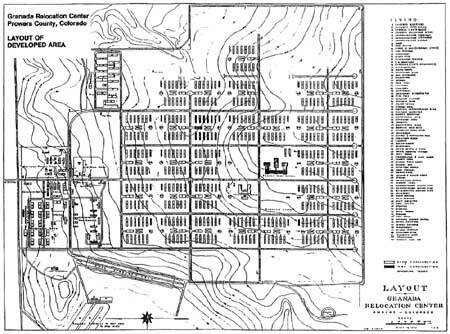 Like most of the relocation centers, buildings and streets were laid out on a north-south grid within an area about one mile square (Figure 5.3). East-west roads were consecutively numbered from 1st on the north to 12th Street on the south. North-south roads extended from "D" Street on the west to "L" Street on the east (I and J were not used). Shorter roads at a slight angle to the grid in the coal storage area were designated "A" and "B" Streets; "C" Street ran adjacent and parallel to A and B Streets before continuing due south next to the residential area. 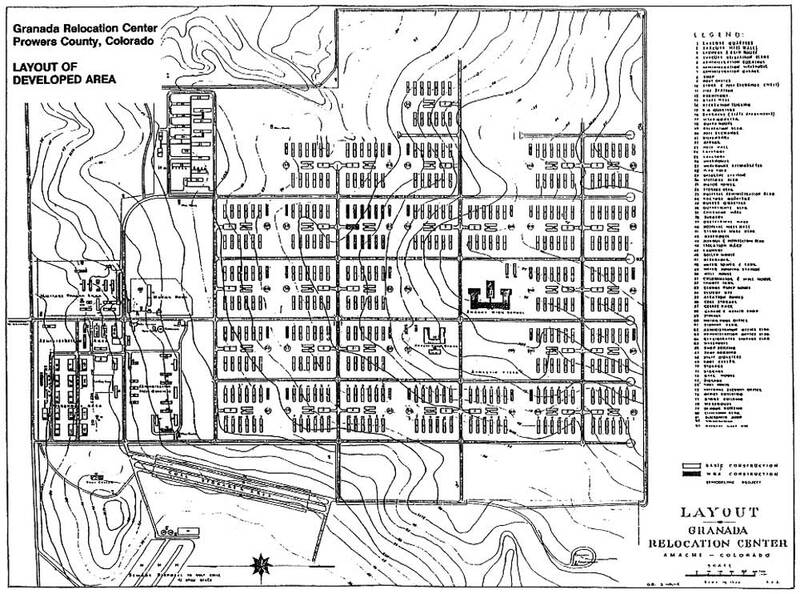 Figure 5.3 Granada Relocation Center central area. Figure 5.4 Watch tower at Granada. The entire developed area was surrounded by a four-strand barbed wire fence, with six watch towers along the perimeter. 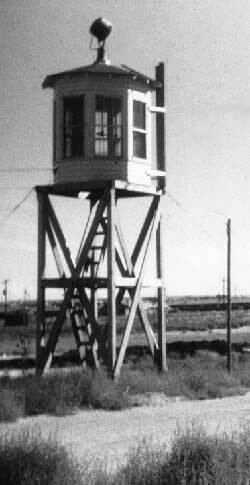 Equipped with searchlights and staffed by military police guards as were the guard towers at other relocation centers, the six at Granada were unique in their octagonal lookout enclosures (Figure 5.4). The only gate in the perimeter fence was at "G" Street, near the center of the north side, approximately one-half mile south of U.S. Highway 50. 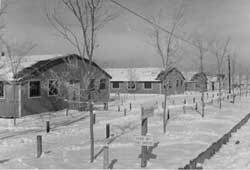 On the east side of the entrance was the Military Police compound, which included an administration building with a flagpole out front, a guardhouse, four barracks buildings, an officers quarters building, a mess hall, two recreation buildings, a dispensary, a post exchange, a garage, storage house, and a tool house. In the later stages of the center's operation when the military police detachment was greatly reduced in number, the WRA used some of the buildings in this area for staff housing and offices (Simmons and Simmons 1993). A visitor center was located south of the Military Police compound at the southeast corner of 4th and "G" Streets. The motor pool area, which included an office, storage building, gas station, and one other building, was just to the south of the visitor center. Farther to the east was the hospital complex, with 17 buildings including an administration building, mess hall, doctors' and nurses' quarters, wards, storehouse, laundry, and heating plant. On the west side of the entrance were the administration and warehouse areas. The administration area included several office buildings, a warehouse, a garage, a shop, a post office, a store, and a recreation building. A staff housing area, to the southwest of the administration area, included a mess hall, four dormitories, and ten staff apartment buildings (Figure 5.5). 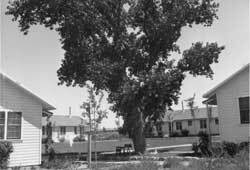 The center's water reservoir, a pump station, a well house, and the fire station were located east of the staff housing area, on the west side of "G" Street. The warehouse area (Figure 5.6), in the northwest corner of the developed area, included fifteen large warehouses, a butcher shop, two latrines, a storage building, and a lumber yard. Figure 5.5. Staff housing area at Granada. Figure 5.6. Warehouse area at Granada. Domestic water was supplied by four 800-foot-deep wells and stored in a 200,000-gallon concrete reservoir located south of the staff housing area. To provide water pressure, water was then pumped to a 72-foot-high 25,000-gallon water tower in the southeast corner of Block 12K, in the evacuee residential area.